I remember seeing a link to a Japanese PCB wrapping guide, anyone have it? I think it's time I made sure my loose PCBs were better protected and I don't have room to box everything. Also, stupid question time. The Japanese always seem to use green ant-static bubblewrap. It generally seems to be pink here. Is there a difference in quality? Anyone have a go-to brand? And what's that tape they use called? It's like a clear duct tape that is easily re-applied. <trk>:I remember catching a big fat one and my friend said "throw it back in, that one already tastes like wood"
Looks similar. Loads of Japanese sellers use it and it's great on bubblewrap because you can peel it off and re-stick it. I think it was Twitter where I saw a link to a Japanese website where they showed how to wrap PCBs like the Japanese shops and collectors do. Wish I'd bookmarked it. Shou will know. Aye, my concern would be that the tape on amazon will be too sticky. Why not use 3M removable tape (scotch)? Too weak? Im running games with a vga to tv converter on my Shangai Novel, with composite and it looks amazing, Im not interested in RGB or Scart. I'd like to see how this is done as well. I've received items from Japan wrapped in some magical way that I cannot reproduce lol. For the uninitiated, what exactly are you guys talking about? Is there some dark art to wrapping a pcb in bubble wrap? Edit: Use a proxy like From Japan to have it sent to Europe. Seems to translate as "curing tape". Loads of it in Japan but it just doesn't seem to be available here, unless it has a different name. Yeah, of course you need the real deal. Can't have european tape/bubble wrap for your japanese boards! Bought some tape on our last trip to Tokyo 2016. Found a business store near the hotel which we raided. Staff looked kind of confused when 4 western guys came in to harvest all the tape. 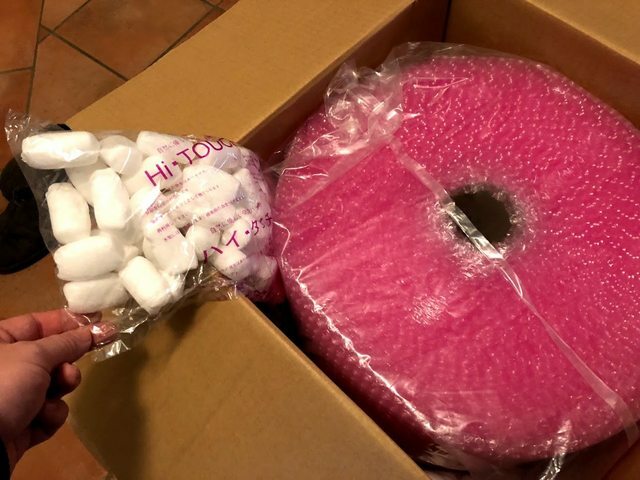 I bought some of the 3 layer bubble wrap from Amazon which I linked in my last post. It came with packing material in the corner, to protect the... packing material. Make sure to wear Japanese white gloves when handling and packing PCBs. Gaijin fingerprints are rumoured to unleash ancient curses. cools wrote: Make sure to wear Japanese white gloves when handling and packing PCBs. Gaijin fingerprints are rumoured to unleash ancient curses. Haha. I bought the exact same model of apron that the staff over at MAK Japan wears in their daily work at the PCB shop. Does that count? limpan wrote: Haha. I bought the exact same model of apron that the staff over at MAK Japan wears in their daily work at the PCB shop. Does that count?